Nevin Karey Shapiro was born on the 13th April 1969, in Brooklyn, New York City, USA, and is a former millionaire and University of Miami booster, but probably best known for being a convicted felon who operated a Ponzi scheme which fraudulently netted him $930 million, for which is is now jailed. He was actually involved in numerous violations over eight years of being a booster for many Miami athletes. So, have you ever wondered how rich Nevin Shapiro is? According to authoritative sources, it was estimated that Nevin counts his net worth at the amount of (minus) -$82 million, as of 2010 when he was sent to prison and ordered to pay restitution for that amount. Before he went to jail, he used around $38 million worth of clients’ money on personal expenses between 2005 and 2009. Nevin Shapiro spent his childhood time in Miami Beach, Florida, as he moved there with his single mother after his parents divorced. He attended Miami Beach Senior High School, from which he matriculated in 1986, and where he was active in sports including wrestling and basketball. While he was growing up, he became obsessed with the Hurricanes football team, as well as Miami in general. Despite his love for Miami, when his mother remarried to businessman Richard Armand Adam, they moved to Lighthouse Point, Florida, and Nevin enrolled at the University of South Florida in Tampa. However, he didn’t graduate, as he was expelled due to cold-cocking another student during a football game in 1990. Ten years later in 2000, Nevin established his own company called Capitol Investments USA, in which he served as the Chief Executive Officer (CEO). He developed the Ponzi scheme, which was based on attracting as many investors as possible, and he did that by promising them that they would make 10 to 26 percent commissions per month. His business grew quickly because of his connections in Chicago, New Jersey, Naples and Indianapolis, which theoretically added a considerable amount to his net worth. Nevin told his employees to create and show to the investors the documents confirming Capitol’s profitability, indicating that Capitol’s wholesale grocery business was making tens of millions of dollars per year, when actually there was no business at all. Nevin later admitted that he never resold those groceries, but instead used approximately $38 million of investors’ money for personal use, including $150,000 that he gave to the University of Miami to have his name placed on the student lounge, and about $2 million for boosting Miami sports, primarily football. In 2009 everything fell apart when a real estate agent from Chicago sued to force Nevin into bankruptcy after he had stopped making payments to his investors. He was charged with securities fraud and money laundering, pleaded guilty and was sentenced to 20 years in prison. 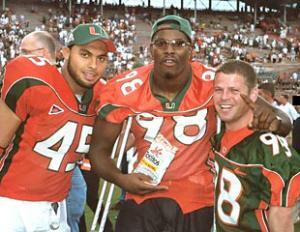 While in prison, Nevin admitted to other illegal and unethical activities, thus exposing many employees and players at the University of Miami. When it comes to speak about his personal life, Nevin Shapiro has never been married. It is known that he was a huge fan of football and basketball teams, so he spent more than $400,000 for floor seats to the NBA team – the Miami Heat. He had residence in Miami Beach worth $5 million, and in free time, he enjoyed in his Riviera yacht with his famous friends at the time, such as Shaquille O’Neal, Dwyane Wade, Kevin Garnett and others. Currently, Nevin is serving time at Federal Correctional Institution, Butner Low, and is scheduled for release in October, 2027.